Breakfast, afternoon snack, or dessert? How about all three?!? 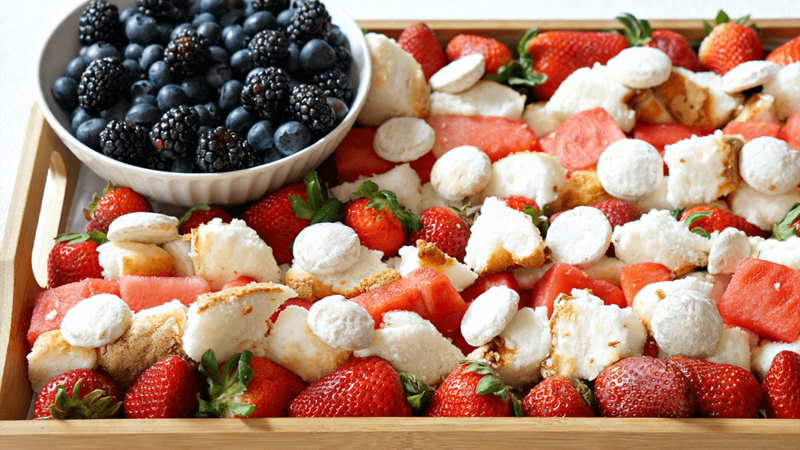 Get in the “red, white and blue” spirit with our fruit flag platter, perfect every family holiday gathering this summer. When we go to the beach we have a lot of meals pre-planned, like these super-easy Honey Mustard Shrimp and Salmon Foil Packs. And, we’ll obviously be grilling burgers on the deck. Can you tell I spend a lot of time planning meals? It comes with the food-blogging territory. Needless to say, I’ve also planned a few fun themed-treats. 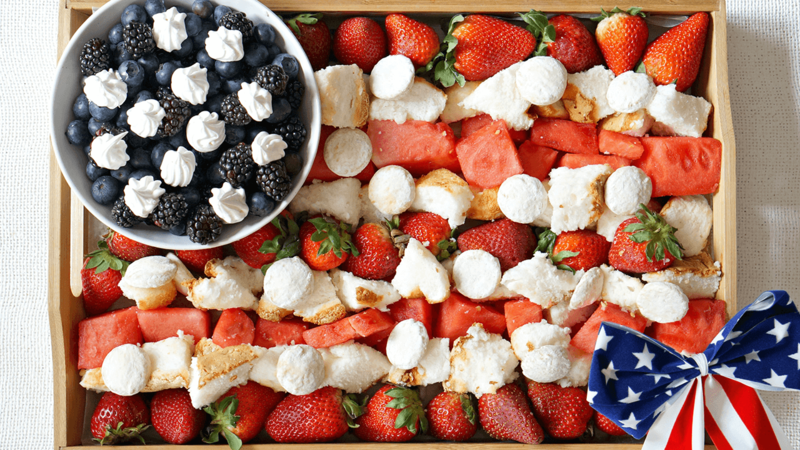 And whether you are at the beach, hanging at the pool, or having friends over for a BBQ, this Memorial Day themed fruit flag platter will be a hit for adults and kids alike. 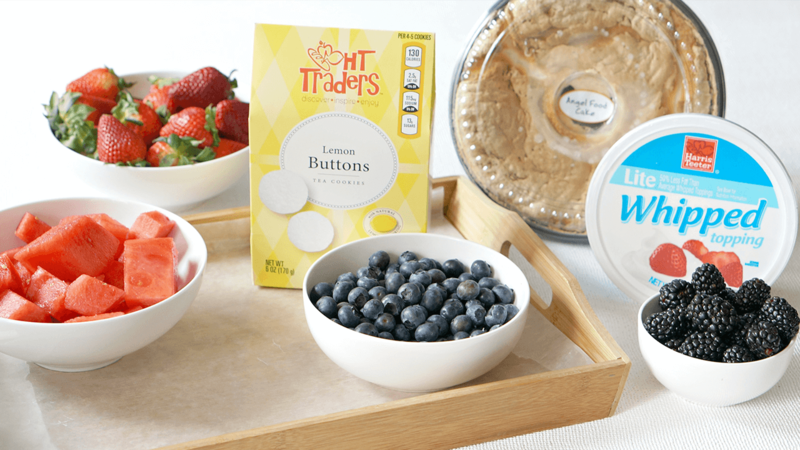 Wherever you’re spending your holiday, head to the nearest Harris Teeter to pick up supplies for this delish Red, White and Blue Fruit Flag Platter! Line your largest rectangular platter (or baking sheet) with wax paper or plastic wrap for easy clean up. Place a bowl in the upper left-hand corner, then begin alternating red berries and watermelon with cubed angel food cake. Insert button cookies into the white layers. Mix blueberries and blackberries together and pour them into the bowl. 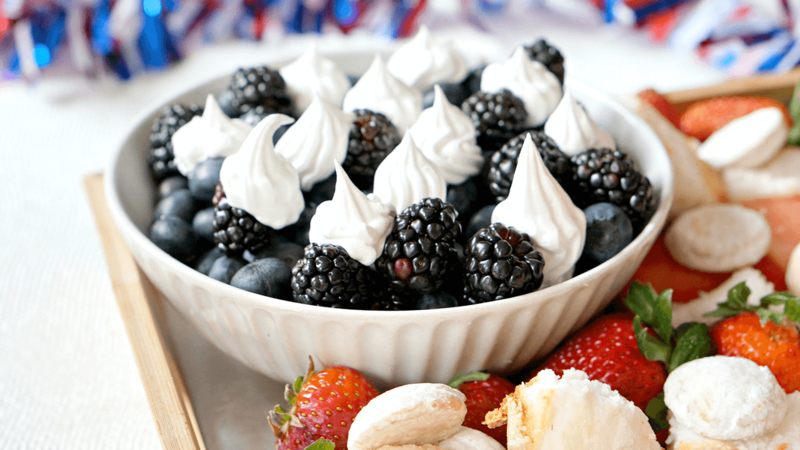 Scoop whipped topping into a pastry bag and dot out “stars” on your berries. Serve and enjoy!